Ambassador Martin Hanz took up his duties as Permanent Representative of Germany to the OECD on 5 July 2017. Mr. Hanz was born on 30 April 1955 in Montabaur. He holds a degree and a PhD in Law from the University of Munich. From 1980 to 1983, Mr. Hanz worked as Assistant Judge. In 1983, Mr. Hanz joined the Ministry of Foreign Affairs where he held a number of high-ranking positions: from 1986 to 1989, he worked at the Embassy of Germany in Tokyo; from 1989 to 1993, Mr. Hanz was appointed Speechwriter of the Federal Chancellor; from 1993 to 1995, he worked at the Permanent Mission of Germany to the European Union, Brussels; from 1995 to 1997, he was a member of the Cabinet of the President; from 1997 to 1999, he was appointed Deputy Head of Cabinet of the Commissioner for Industry at the Cabinet of the President at the European Commission. From 1999 to 2001, Mr. Hanz was nominated Deputy Head of Cabinet of the President at the European Parliament; from 2001 to 2006, Director of the European Union Department and Legal Advisor of European Union Law at the Federal Foreign Office in Berlin. 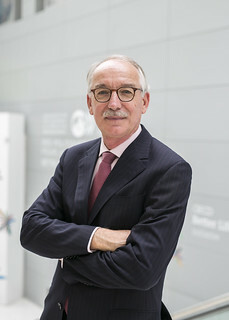 From 2006 to 2009, Mr. Hanz was appointed Head of the Political Department at the Permanent Mission of Germany to the United Nations; from 2009 to 2011, he served as Ambassador of the Federal Republic of Germany to Estonia; from 2011 to 2014, Mr. Hanz was Inspector of the Foreign Office. From 2014, until his appointment as Permanent Representative of Germany to the OECD, Mr. Hanz was Deputy Head of Mission at the Embassy of Germany in New Delhi, India and subsequently, Chargé d’Affaires at the Embassy of Germany in Budapest, Hungary. Ambassador Hanz is married and has three children.